Martin Luther King Jr.’s grassroots Poor People’s Campaign ended as soon as it started. But, nearly 50 years later, the coalition is reforming across the nation. A group in Florida has formed its own sect of the campaign, one of 32 states. And on Monday, at a press conference, the group announced its new objectives. In 1968, Martin Luther King Jr. formed the Poor People’s Campaign to wage a war on poverty. It asked for an Economic Bill of Rights that could lift the load on low-income individuals. King’s assassination a few months later led to division within the campaign and its eventual end. But now, thanks to the efforts by two clergy, William Barber and Liz Theoharis, the Poor People’s Campaign has new life. Reverend Ron Ross focused on this when he spoke at Monday’s press conference for Florida’s division of the Poor People’s Campaign. “My brothers and sisters and fellow Floridians. I simply stand here today to declare for god that the Poor People’s Campaign of Florida has heard your call. And we are assuming the role as the search for someone willing to stand in the gap for the needy. Someone willing to stand in the gap for the disenfranchised,” Ross says. Ross comes from the same church in St. Augustine where Martin Luther King held one of his marches. 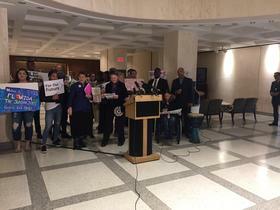 “The Poor People’s Campaign stands here in the Florida State Capitol building, and responds to your call of the role here. We are here to stand in the gap,” Ross says. Florida’s division of the Poor People’s Campaign focuses on the state’s poverty issues. Karen Woodall, Executive Director of the Florida People’s Advocacy Center, uses Florida’s ALICE report as a guideline for what the state’s campaign should focus on. The ALICE Report is a United Way project that measures the households in communities that do not earn enough to afford basic living necessities. “It found that out of Florida’s 7.5 million households, 14.5 percent of them earned below the federal poverty level. 29.5 percent of them are just above poverty, in what they call the ALICE category, and they are working. So that’s a whopping 44 percent of households in Florida who could not afford basic needs,” Woodall says. The Campaign is backing lawmakers and bills that protect low-income individuals. Lawmakers like Rep. Carlos Guillermo Smith (D-Orlando), and his proposal, House Memorial 1658, asks Congress to adopt certain measures that reduce income inequality. Measures like a modernized income tax, and a minimum wage that people can live off of. “Because we have a regressive tax structure, as was mentioned earlier. Because this legislature has refused to listen to legislation that addresses issues like equal work for equal pay for women. Because the legislature refuses to address the issue of raising the minimum wage to 15 dollars per hour, a living wage. Because this legislature refuses to stop stealing money out of the Sadowski affordable housing trust fund,” Smith says. The measure has its first committee Tuesday. Copyright 2018 WFSU. To see more, visit WFSU. Equity is a growing focus in South Florida, as communities try to address problems like high housing costs and a car-centered transportation system that excludes some public transit users. A new organization is hoping to spur even more conversations about how to resolve some of those problems. It’s called the Miami Urban Future Initiative and its goal is to bring together researchers, business leaders, officials and activists on critical equity issues that accompany South Florida's ongoing growth. Low-wage jobs in Florida are one of the main reasons families live in poverty or near poverty, according to a new study by Florida International University. The yearly report, “State of Working Florida,” found Florida’s economy to be unbalanced and unequal. While unemployment numbers are down statewide, that has not made a dent in income disparity across the state. As midnight strikes on New Year's Eve, many minimum wage workers will have an extra reason to celebrate: They'll be getting a raise. 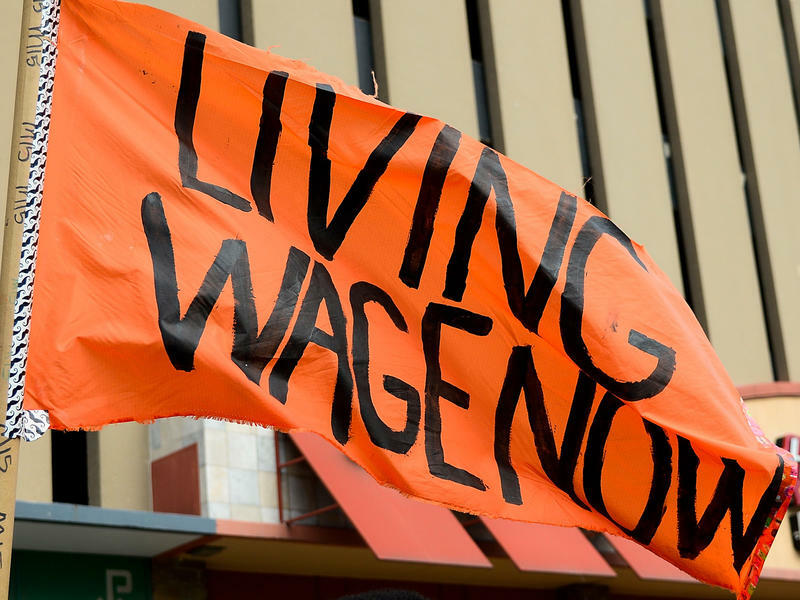 In 18 states and 20 localities, lawmakers are forcing up the minimum wage on Jan. 1. For years, a large number of state and local governments have been driving up wages in response to federal inaction. Congress has kept the federal minimum wage at $7.25 an hour since 2009.